by Julie Fouts, Events Co-Chair, Chicago R.I.S.E. 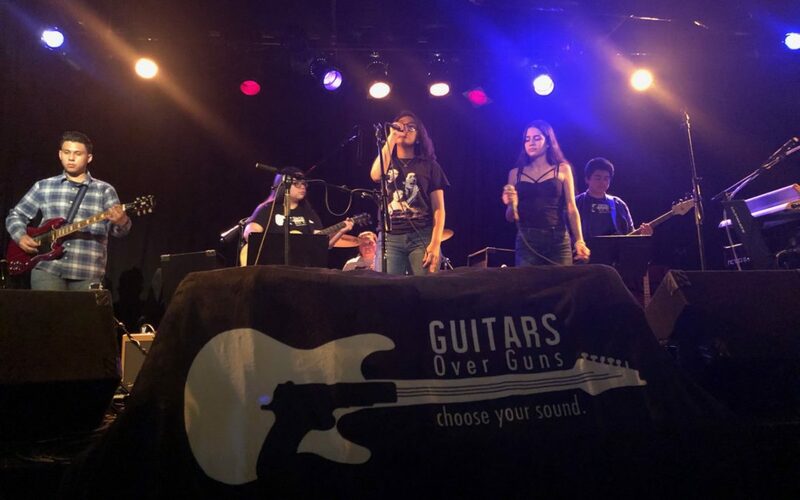 On Saturday, January 12th, our Evergreen Academy Middle School alumni took the stage at Martyrs’, a well known and highly attended music venue in Chicago. Martyrs’ has a lot of history. Their stage has been graced by the likes of Jack Johnson, Spoon, Wilco, Death Cab for Cutie, Beck and Andrew Bird, just to name a few. Now add The Legacy to the list. The Legacy is a group of eight top-notch high school students, all graduates of Evergreen Academy Middle School and the Guitars Over Guns after-school program. They have since parted ways during the day to separate high schools, but come back to their roots once a week after school to practice together. And these kids ROCK. This group works tirelessly on their craft. Not only do they come in to jam out and fine-tune their musical skills; they are also giving back to their own community. They spent the month of July developing and refining their leadership skills, and now come into the after-school program weekly to serve as peer mentors and guide the current middle school students through their own challenges. The event that Saturday was electrifying, with over a hundred guests. They played some hits like “Can’t Stop” by the Red Hot Chili Peppers, “Valerie” by Amy Winehouse and “Come Together” by The Beatles. They had so much energy throughout the whole performance, and set the tone for the other bands – BRUCE, Spacebones and Bully in the Hallway. But best of all, this event was put on with Guitars Over Guns in mind. Over $2,000 was raised, with all proceeds going straight to these kids through our newest Chicago program, Guitars Over Guns R.I.S.E. This was my first opportunity to really interact with some of these high schoolers. I’ve heard a lot of wonderful stories, but as a new member of the R.I.S.E. board, it was so fantastic to put faces to names and start to create my own memories with them. I’ll have these initial moments and those smiles from them up on stage in the back of my head as I plan my upcoming events. It was so motivating. It was absolutely amazing to see these hardworking and talented kids up on stage in front of a packed room. They exuded the most confidence we’ve seen from them and they all came back telling us how much fun they had. It’s experiences like this that continue to show them how remarkable they truly are, and I can’t wait to continue to find more opportunities like this for them to shine.